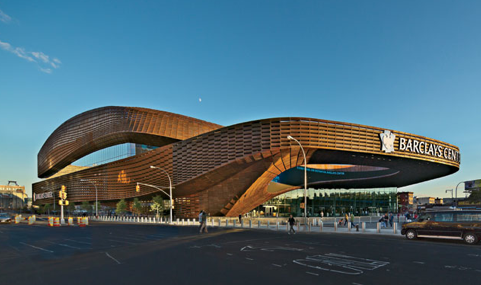 The US Green Building Council announced yesterday that the almost 1-year old Barclay’s Center, home of the Brooklyn Nets and future home (2015) of the New York Islanders, has achieved LEED (Leadership in Energy and Environmental Design) Silver certification. This makes the Barclay’s Center the only one of the 6 new stadiums/arenas in the NYC/NJ to earn any type of LEED status. GSB has been running an occasional 6-part series, “How Green Is Your New York/New Jersey Sports Team”, on the green-ness (or lack thereof) of those 6 facilities, in chronological order of their construction. Yesterday’s column, on Red Bull Arena (NY Red Bulls, Major League Soccer), was the 4th in . The other 3 featured Newark’s Prudential Center (NJ Devils), Citi Field (NY Mets), and Yankee Stadium (NY Yankees) (DUH!). Still to come is MetLife Stadium in the Meadowlands (NY Giants and J-E-T-S! JETS! JETS! JETS!) and the Barclay’s Center.